The technology penetration is increasing at a significant rate, impacting the rise in sales of mobile devices, laptops and other gadgets. But the problem of carrying multiple chargers comes along with the electronic devices. Dart charger is a single solution compatible with all kind of electronic charging devices. From laptops to mobile phones to televisions, dart charger can prove to be a universal charger in a compact size, available with multiple power tips but universal adapter. The integrated AC plug eliminates the bulky cord/cables. In general, charging adapter of the laptops adds 40.0% weight of the laptop on the shoulders. Dart charger can efficiently convert more than 90% power and can signify the overvoltage, overcurrent and overheating situations. Various startups coming into picture are being funded in this field such as Nordic Power Converters, Cambridge electronics and more. FINsix Corporation has received a total funding of USD 21.6 million in 2015 for technology advancement in transforming power for consumer electronics. Goldstein Research analyst forecast that the global dart charger market is growing at a CAGR of 1.3% over the forecast period. Global sales of Smartphone reached USD 478.7 billion in 2017 from USD 330.4 billion in 2013, double in just four years. On the back of this factor, dart charger manufacturers can target potential markets with smartphone user base. Moreover, electronic devices gadgets after market is growing rapidly in developing nations as 62.3% of the users in cities prefer to get a new charger after the expiration of one. 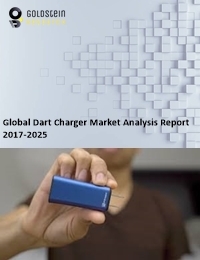 The report covers the present ground scenario and the future growth prospects of the global dart charger market for 2017-2025 along with the unit sales and global revenue of the dart charger market. We calculated the market size and revenue share on the basis of revenue generated from major players across the globe. We have forecast the market on the basis of investments, shipment data, and presence of the major players. On the basis of distribution channel, online platform accounted for major sales made by companies in 2017, contributing 68.3% of the total sales made through various distribution channels. Online distribution channel is expected to continue the larger market share in future. Laptops are the major application of the dart chargers among others, and are likely to grow at a CAGR of 1.8% over the forecast period. Global dart charger market outlook 2017-2025, has been prepared based on an in-depth market analysis from industry experts. The report covers the competitive landscape and current position of major players in the global dart charger market. The report also includes porter’s five force model, SWOT analysis, company profiling, business strategies of market players and their business models. Global dart charger market report also recognizes value chain analysis to understand the cost differentiation to provide competitive advantage to the existing and new entry players. With the advent of large players such as Finsix flourishing in U.S.A., huge market opportunities have opened up for the other players to establish their manufacturing and supply chain globally, majorly in the developing regions. The trend of expanding a company by mergers and acquisitions with the local players is majorly expected to boost the growth of global dart charger market. The rising sales of electronic devices and the demand from the consumers for all-in-one accessories is the primary driving factor in the expansion of global dart charger market. The everyday tasks on the electronic devices tend to consume battery faster and thus the availability of dart charger simplifies the application of devices, without the hustle of multiple chargers. Strong presence of local players in emerging countries such as China, India and others is one of the major challenges for dart charger brands to expand their footprints in those nations. Moreover, large availability of low cost chargers in low income countries due to high demand for low quality products is also keeping away the global and quality manufacturers of dart charger. Based on geography, North America accounted for largest market share of 38.7% in 2017 owing to the presence of major players in this region. United States alone contributed a revenue share of more than 65.0% in North America dart charger market. The major reason behind the dominance is the huge base of consumer electronics users in the country. Population in developed nations such as U.S., Germany, Australia, South Korea, Japan and others are always incline towards the latest and advanced technology based products. Eradicate the necessity of carrying multiple charges while travelling is one of the key trends which is gaining traction among the travelers as well to carry a single charger for all their electronic devices. On the other hand, Asia-Pacific dart charger market has ample of future prospects which leads the dart charger industry to a new tunnel. Emerging economies and large consumer electronics user’s base in nations such as China, India, Vietnam, Indonesia, Japan, Singapore, South Korea and other pacific countries are attracting global manufacturers to expand their horizons in opportunistic markets. Global dart charger market report comprises of the following companies as the key players in the dart charger market: FINsix, Nexgen, Nordic Power Converters, Cambridge Electronics, Appulse Power, Shenzhen LVSUN Electronics Co. Ltd, Bolweo, Group West International. What is the revenue of global dart charger market in 2016-17 and what would be the expected demand over the forecasted period?